There was a warm, lively atmosphere in the heart of the city as we took a stroll after a wonderful dinner. 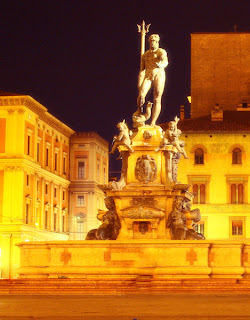 Being a university city (home to the oldest university in Europe) Bologna is buzzing with young students in the streets in the evenings. They gather in groups in the squares and under the porticoes, the typical arcades of Bologna (all 38km – about 24 miles of them). At night the porticoes seem like the insides of long, softly lit serpents wending their way into the blackness. ﻿﻿Because it is not on the usual tourist trail, Bologna retains an earthiness not found in other similar sized cities like Florence or Venice. Walking through the illuminated medieval town centre is a magical experience. There is a small-town feel in this big city. 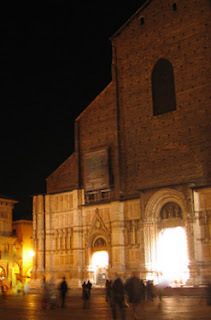 We started our stroll in Piazza Maggiore, dominated on the left-hand side by the impressive Basilica of San Petronio, the fifth largest church in Europe. On the opposite side of the square is the Palazzo del Podestà. Adjacent to it is Bologna’s city hall (palazzo comunale) with its magnificent clock tower and carillon clock. ﻿Leaving the square we passed these cute Vespa scooters posing on Via Santo Stefano. Turning into Via Clavature, behind Trattoria Da Gianni (which looked like a lovely place to eat outdoors) we noticed that the door of the church behind it was open. 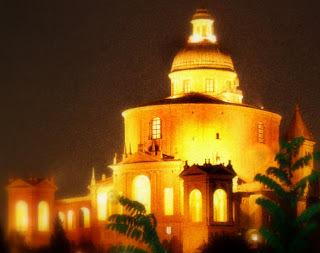 It was the Santuario Santa Maria della Vita and the Baroque interior was elegant and airy. 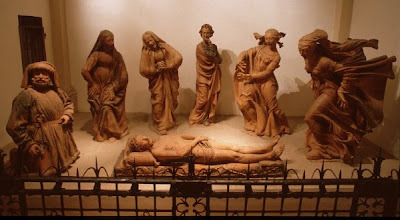 The six life-sized terracotta figures are standing around the body of Christ, lamenting his death. They are highly realistic with expressions of grief and torment on their faces, a mixture of motion and emotion, in dramatic poses with the women’s robes flying out behind them. I was particularly in awe of the two Marys on the right. Joseph of Arimathea, Mary Salome, the Virgin Mary, Saint John the Evangelist, Mary of Cleophas and Mary Magdalene in visible distress. This masterpiece was created by Niccolò Dell'Arca an early Renaissance sculptor in 1463. (If you look closely, you’ll see his name engraved on the tasselled pillow.) The poet Gabriele D’Annunzio was so moved after seeing these scupltures that he wrote about them in his story ‘Le Faville del Maglio’ (The Sparks of the Hammer) and described this work perfectly as a ‘scream turned to stone.’ The Compianto sul Cristo morto is an exceptional work of art and one that I feel will remain in my memory forever. Leaving the Sanctuary we turned into Via Farini. If you like to shop for clothes, you're going to love the Galleria Cavour on this street. It has a lot of chic high fashion shops including Armani, Gucci, Prada,Yves Saint Laurent and Versace. In August during the sales there are reductions of 50-70% in most of the stores. It reminded me of the Galleria Vittorio Emanuelle II in Milan. 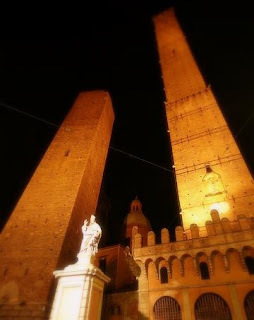 Nearby in Piazza Ravegnana are the Two Towers, the main symbols of the city. Torre degli Asinelli is 97m tall with 498 steps to the top from where, on a clear day, you can enjoy spectacular views of the red roofed city. Torre dei Garisenda is not open to the public as it has a lean of over 3m (10 feet). Both were built in the 12th century. On the way back on this balmy night we stopped for ice-cream at Cremeria Funivia on Via Porrettana. It is so named because there used to be a cableway from this point up to the Santuario San Luca on the hill (Colle della Guardia). Enrico, a lifelong Bologna resident said that it was one of the best places for gelato in the city. All of the homemade gelato is made fresh daily on the premises. I tried the nocciola and it was excellent!